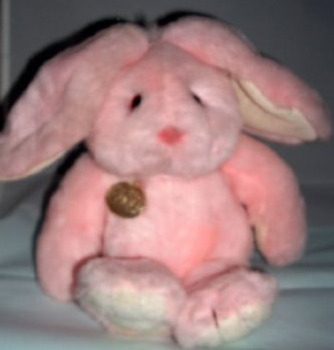 I’m looking for a 1991 GUND Jellybean pink rabbit is about 12 to 14 inches long. 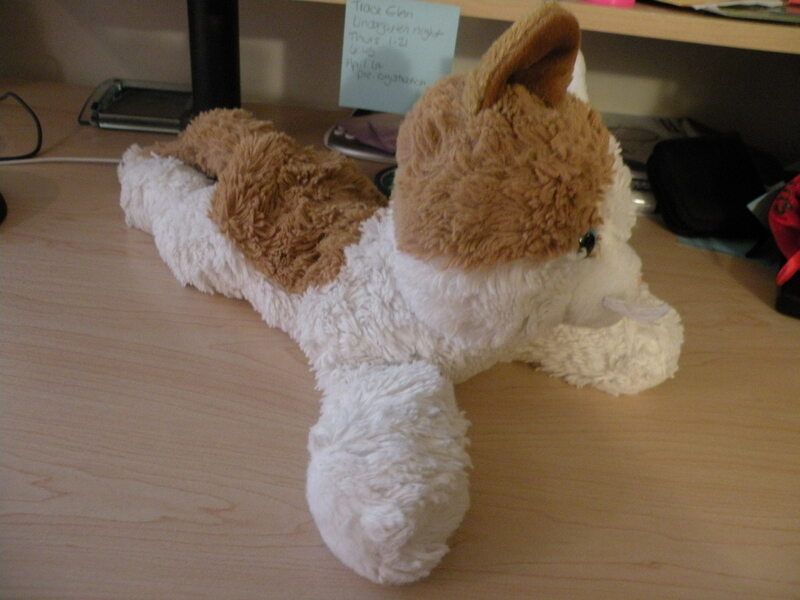 It has large lop ears lined in white and has big white feet. I’m looking for a friend for a 1992 GUND all black bear named Velvet and a 1991 GUND pink and white lop eared rabbit named Jellybean (not sure if that’s Jelly Bean or one word). The black bear does NOT have a red open mouth. These are for two young people who lost their childhood stuffed Gund toys in the wild fire that destroyed their home. 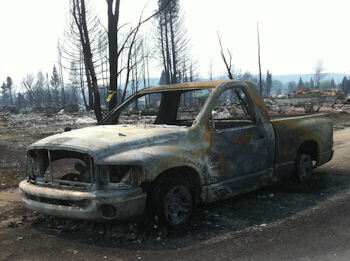 The winds were 100 km an hour, so there was no time to pack anything, but only time to evacuate as quickly as possible. 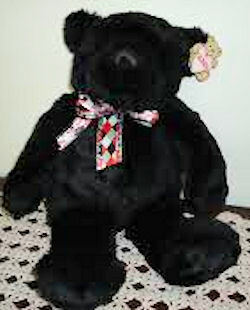 The black bear was her son’s treasured teddy, and the pink bunny belonged to her daughter. They slept with them from the time they were babies. I believe they were the first stuffed animals given to them. Although they are grown now, they still had them in their room for comfort until the fire destroyed their home in Slave Lake Alberta on May 15th. They lost everything but a few clothes and a few pictures. I’m looking for a Mothercare tan bear that is about 12 inches or 30 centimeters long from head to foot. The tag number was CIF A81108110, and it was made in Vietnam. It was available in Mothercare around 2002. 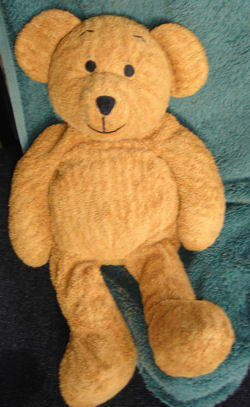 I purchased this teddy bear from Mothercare in 2003 when my son was born. We named this bear Ted! He was loved and adored by my son Kris. Ted went through a lot with Kris, as he was born with a congenital heart condition called Fallot’s Tetralogy. Ted went to every hospital appointment with Kris, always staying overnight in the hospital with him and even had a 7 hour operation with him to fix his heart!!!! Ted spent 7 weeks in intensive care keeping Kris company. They truly were inseparable. Unfortunately, 5 years ago Ted became lost in a house move!! Kris was devastated….I tried different bears, but it just wasn’t the same….over the last few years I have searched for Ted, but never had any luck. Kris had to go through his hospital checkups without Ted. At a recent appointment, the consultant has told us that Kris will be needing another operation on his heart in the near future. Kris instantly wanted Ted. He became upset at the thought of not having him by his side. At the age of 11 he still misses him dearly. He would love to be able to take Ted with him once again while the amazing doctors fix his heart for the second time. 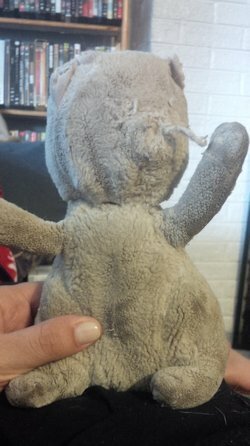 I would love to be able to reunite my son with Ted! I want to see the smile on his face when he knows that Ted will be going on the journey with him through more surgery….it’s the only thing he has ever really wanted back, and I know he misses him dearly. This story is long, but worth reading and responding with a word of encouragement, along with your help finding Cat Cat. 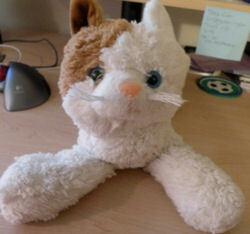 I’m looking for a 1988-1990 Russ seated white cat. He is holding an envelope that says ‘Sealed with a Kiss’. He has hard green eyes, a pink nose, and pink thread through his paws. He is all plush, and the mouth is sewn on. His tail is secured to his back. He has small ears almost an inch long, folded toward his head, but not secure. He is approximately 6-8 inches tall. Cat Cat was given to me when I was about a month old by my dad. I was born six and a half weeks early, and this was the first toy I took interest in. My father realized this and bought two more. Sadly they are gone. I only have the original. My parents divorced when I was 4, and for good reason. My birth mother is not a nice person. She abused me, emotionally and physically for 16 years, until she finally did something so horrible, I still have nightmares 10 years later. My father was unaware, because I was scared to tell him. He knows the truth now and married the woman I have called mom since I was 16. Due to all that, I became severely depressed and tried to take my life several times, once finally almost succeeding. They had to resuscitate me, and I was in the ICU for three weeks before they took me to a rehab facility. All this time, throughout my whole life, Cat Cat has been my comfort. My security. I have worn him down from always rubbing his paws, ears, and face. His smell is my comfort. I still battle depression, but I have recently discovered I am sick. Very sick. I have a severe allergy to mold and wheat, but they found I have Lyme disease with a co-infection of Babisiosis. It is a parasite that grows in the red blood cells. This parasite attacks your body systems and evolves when attacked by medicine. Due to this, I am on antibiotic chemotherapy and am taking a lot of medication. My body is immune compromised, which makes it easy for the parasite, and harder for me to fight. I have to wear Hepa filters inside my nostrils to catch toxins, because my body can’t fight anymore. I have neuropathy, muscle weakness, fatigue and severe headaches all the time. Now, even at my adult age, Cat Cat comes with me everywhere. Always. Work, and all between. I know that sounds childish, but I need the comfort, all the time. I honestly don’t know if I could survive if something happened to Cat Cat. I’m scared of not having him, and need to find another one. We have been searching All corners of the Internet, spending hours looking, but I cannot find him anywhere. I don’t have much money, but I’m willing to pay as much as I can to have one that can be with me until the end. This photo is of an identical orange kitty. The one Shaz is looking for a GRAY and WHITE one, and Shaz is looking for the Black and White one. I’m looking for a Target Circo gray and white cat. From head to tail it’s around 15 inches and ear to toe it’s 12 inches long. I bought it for my son who has autism, and he sleeps with it every night. We lost this cat, and I can’t find it. He looks for it every night. Please let me know if anyone has it. I am willing to buy in any condition, new or used. I’m looking for a pink stuffed lamb. When you press her foot there is music that plays Brahm’s Lullaby. There is a ribbon around the neck, well three thin ribbons. I think they’re pink, purple, and yellow. It is from the early 90’s. I got one for my first Easter in 1990. She was my Lambsie Dambsie Dyzey. That’s what I named her :). I had that thing until I was sixteen. Then one day the bag which held my lamb and my baby blanket was stolen from me. It makes me tear up to think about it. Now I’m about to have a baby girl, and I’m looking for a stuffed lamb that plays music for her. It’s bringing all my Lambsie Dambsie Dyzey memories up. I really wish I could find another one. Jessica is also looking for this cat?, and Yvette is still looking for this bear (might be a cat) that MAY be a Stuffins animal. 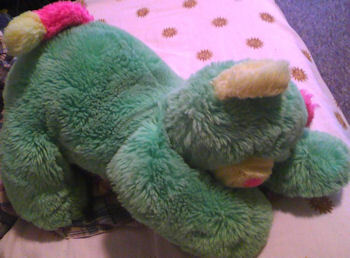 She has added that the nose was plush, not hard, and it’s about 18-20 inches long. And now she’s found a better photo, plus Matt was kind enough to send some, too. His did not have a tag, though, so we still don’t know the brand. Chris tells us that he was part of at least a series of three: there was Lime the Bear, Lemon the Dog, and Strawberry the Raccoon, bought at Costco around 1995. Can you help with the brand? 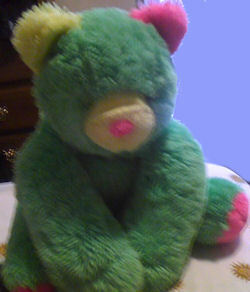 I’m looking for a neon green, pink, and yellow floppy furry bear. His front legs were longer than his back legs, and he lay on his tummy. He had solid black eyes, and his tail was a little long, even though he was a bear lol. I do not know his maker or the year that he was made… I am guessing he was made in the early to mid 90’s, but it could be earlier than that though. He is definitely NOT a Puffalump. When I was about 7 years old I met a girl down the street from me whom I played with everyday. 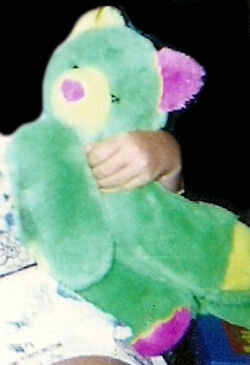 She had this bear, and for some reason I grew very attached to it. She let me borrow him, and it ended up causing a huge fuss, because I guess I wouldn’t return him to her haha… We ended up trading toys in the end. I was 14 years old when Cubby disappeared. Since then, I have desperately searched for a copy of Cubby, but with no luck. I only have a few photos of him, and none of them are very good ones. This photo is the best one I have. Having him back would mean so much to me… I guess it’s silly that I hold onto my childhood for so long.. But it’s who I am! I have a daughter of my own now, and I would love for her to see my favorite childhood toy. Cubby would be in my bed with me every night again if I could find him haha.